Funeral service for William E. ‘Bill’ Francis, will be at 1:00 P.M. Sat., Jan. 19, 2019, at Niobrara County Fairgrounds in Lusk. Interment will be at 2:00 P.M. Mon., Jan. 21, 2019, at Willow Grove Cemetery in Buffalo, Wyoming. He passed away Mon., Jan. 14, 2019, at his home in Prairie Center Wyoming. William Elmer ‘Bill’ Francis was born in Buffalo, Wyoming, June 18, 1930, to Lawrence and Bessie May (Foreman) Francis, joining his 2-year-old brother, Ivan. When Bill was 2 years old, his mother Bessie died, leaving Lawrence to raise the two young boys. Lawrence worked hard to provide for his family and was unable to be home most of the time, so aunts, uncle, and relatives near Big Trails, Wyoming helped raise the boys. Bill had memories of being cared for by his Aunt Marge and riding with his Uncle Harry on horse-drawn hay equipment. The family returned to Wyoming when Bill was 13. Lawrence took a job with the Johnson County Sheriff’s Department and was a Deputy for a time before becoming Sheriff. Bill spent his teen years in and around Buffalo working and going to school. At 18 Bill was living with his grandparents. His grandfather was an office on the Buffalo Police Force, and his uncle and aunt lived on the Ogallala Ranch north of Douglas. 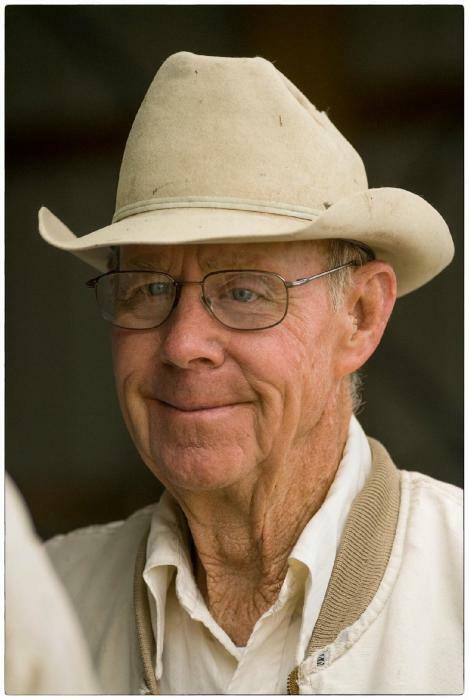 Bill began working on the ranch for the family of Mr. and Mrs. Leroy Moore. Eddie Moore asked Bill’s Uncle Chuck if he know of anyone he could hire to live the winter and take care of 200 cattle and about 2500 sheep, and Bill agreed to go. Now 19 years old, Bill worked alone throughout the terrible winter of 1949 on the Finley Place north of Douglas. He managed to get by with minimal stock losses, losing only 1 cow. He never saw another living human during that entire winter. After that, Bill went to work for Taylor Ranch Company, and in 1951 married Della Jean Gibbany of Midwest, Wyoming. Later that year he joined the US Army and was stationed at Camp Chaffee, Arkansas, where he received medals in driving and sharpshooting. He then went into the Reserves as a Corporal, and was honorably discharged, returning to work at Taylor Ranch Company. Bill and Della had 3 children, Doris (who died in infancy), Sandy, and Kelly. Bill attended the Wyoming Law Enforcement Academy and was in the first graduating class in 1964. He then took a job with the Wyoming Highway Patrol, where he served for approximately 6 years all over the state. Bill put together rental properties and went into business for himself with Bill’s Fixit Shop in Cheyenne. In the winter of ’76 he went to work for Teton Construction Company and became Truck Forman. He married Christine Lummis in 1980 and went into cattle ranching. In the late ‘80s the couple moved to the Hat Creek Community and formed the Francis Hat Creek Ranch north of Lusk. Bill was a Master Mason. He was initiated at Castle Rock Lodge #45 in Edgerton, Wyoming. He was the Master of Harmony Lodge #24 in Lusk 2008-2009. He is survived by his daughter Sandra and her husband, Hall Puckett, of Houston, Texas and his son Kelly Francis of Prairie Center; three granddaughters, Jessica, Audra, and Sara; and 6 great-grandchildren. Preceding him in death were his parents; brother Ivan; half-siblings Jack, Eddie, Velma, and Thelma; former wife Della; and infant daughter, Doris.